The tiny Harvest Mouse lives in long tussocky grassland, reedbeds, hedgerows and around woodland edges. They build a spherical nest of tightly woven grass, high up amongst the tall grasses. They are mainly vegetarian, eating seeds and fruits, but will also eat invertebrates. 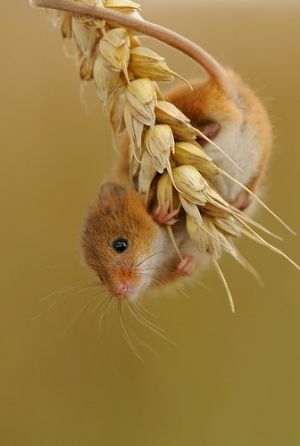 The Harvest Mouse has pale, ginger or yellow fur and a white belly. Its tail is almost hairless and nearly as long as its body. Southern and central England. Also can be found in north & eastern england up to the scottish borders. The loss of our field margins, hedgerows and grassland habitats is a threat to this species. Working with farmers and landowners to ensure wildlife-friendly practices, The Wildlife Trusts are working towards a Living Landscape: a network of habitats and wildlife corridors across town and country, which are good for both wildlife and people. You can support this greener future by joining your local Wildlife Trust.